Military precision, sleek shining lines of gliding penitents, and the sheer scale of these atmospheric Semana Santa processions in Cartagena make this one of the most popular Easter Week events in the Region of Murcia, and certainly well worth visiting if just to see a spectacular display on a grand scale. 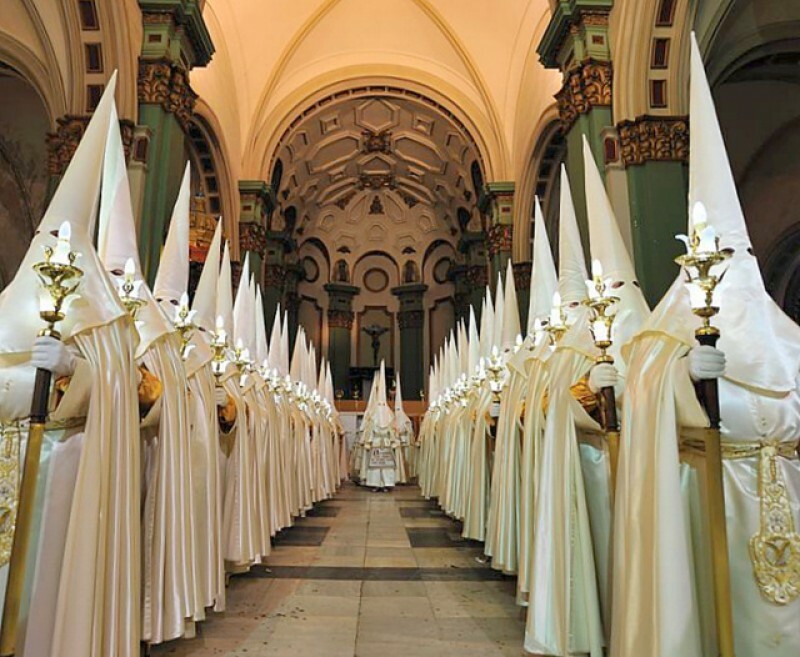 Semana Santa in Cartagena is unique, and in very few ways resembles processions in other parts of the region in spite of having the same core elements. The city’s military background and long naval history have resulted in regimented processions, silent lines of synchronised penitents, staffs tapping in unison, smooth satin shining in the glow of polished lamps. Yet, although the processions are impressive in their scale and richness, there is still an incredible intimacy to Cartagena’s Semana Santa. The narrow streets with crafted wrought iron balconies and sensuously curving modernist buildings create an atmosphere which embraces those who watch the passing of satin and intense faith, and the whole experience is an enveloping and intimate one. 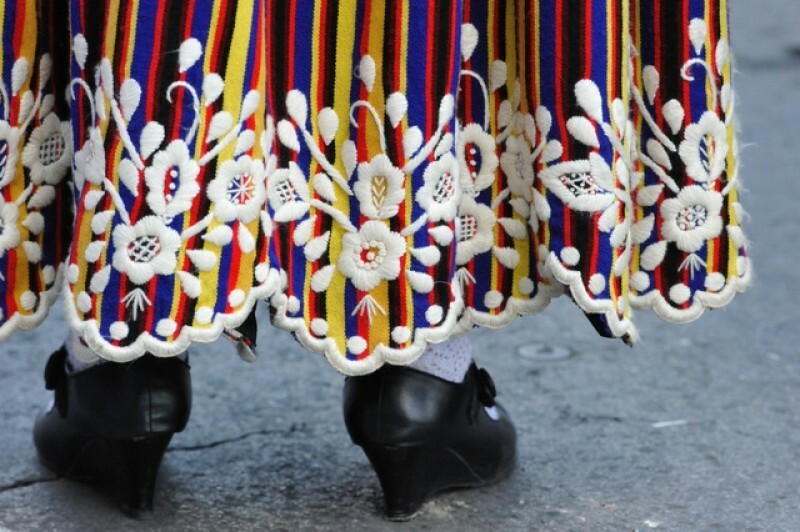 There are four brotherhoods or Cofradías, the most famous being the Californios, who wear red, and the Marrajos in deep purple, with a traditionally deep rivalry between the two. The Royal and Illustrious Brotherhood of Our Lord Jesus of Nazareth, known as Los Marrajos: this is the oldest brotherhood, dating back to the 17th century and the port of Cartagena, the nickname coming from the tradition that in order to pay for their procession, fishermen earned the extra money needed by selling a specific species of fish, a mako shark, known as a marrajo. They wear distinctive rich purple and organise the two main Good Friday Processions, the procession of the Promises of piety on Holy Monday and of the True Cross on Saturday. The Illustrious Brotherhood of the most Holy and Royal Christ of the Succour was founded in 1691 as an aristocratic brotherhood by the Duke of Veragua as a means of giving thanks for the miraculous cure of his son. He also built a spectacular chapel in the old cathedral of Cartagena, but sadly this was gutted during the Civil War. Their main job is to head the Via Crucis on the morning of Viernes de Dolores, an early morning event which begins at 3.30 in 2018 on the Friday before Palm Sunday. The Californios (full name “La Pontificia, Real e Ilustre Cofradía de Nuestro Padre Jesús en el Doloroso Paso del Prendimiento y Esperanza para la Salvación de las Almas”) date back to the 18th century, and some claim that they owe their name to the participation of a group of seafarers who had made their fortunes in California. This was a well-funded brotherhood which gathered an impressive collection of sculptures by the master sculptor Salzillo as the city enjoyed a time of economic stability and growth. Sadly most were destroyed during the turbulence of the Civil War, the present collection mainly created by Maríano Benlliure. They’re distinctive in their vibrant red habits, and are most in evidence on Wednesday night in the great procession of the Taking of Christ, on the night of Viernes de Dolores, the Palm Sunday procession, the journey of the Apostles on Holy Tuesday and the procession of silence on Maundy Thursday. The Royal and Illustrious brotherhood of Our Lord Jesus Resurrected. Glowing in white, this brotherhood is the youngest, founded in 1943, and organizes the procession of the Resurrection on Easter Sunday morning. 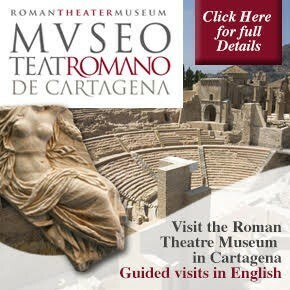 Click for parking in Cartagena. As well as being the first day of Holy Week this Friday is also the feast day of the patron saint of Cartagena, the Virgen de La Caridad, making it a day of special significance and a local holiday in the city of Cartagena. 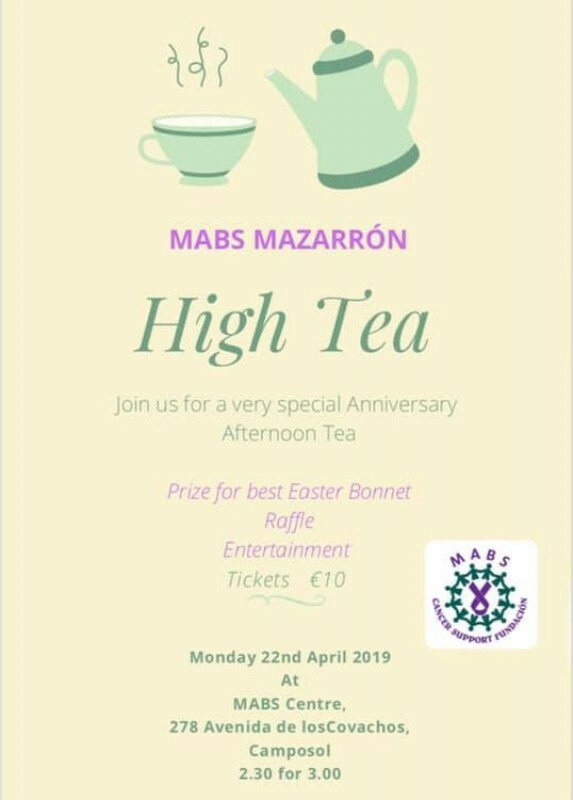 It’s worth making the effort to come into the city to see this, as there are two elements, the first processions of Semana Santa intertwining with the floral offering to the Virgen. On this Friday the events begin early in the morning, with the first procession strictly reserved for very early risers or those who are extremely late to go to bed, at 3.30! 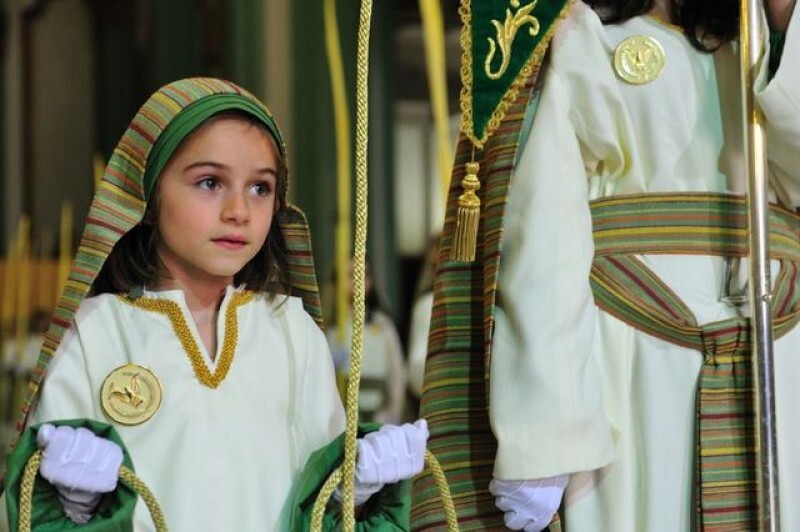 Later in the afternoon a substantial Vía Crucis with large “tronos” takes one route, while hundreds of people dressed in regional costume make a floral offering via a separate route. 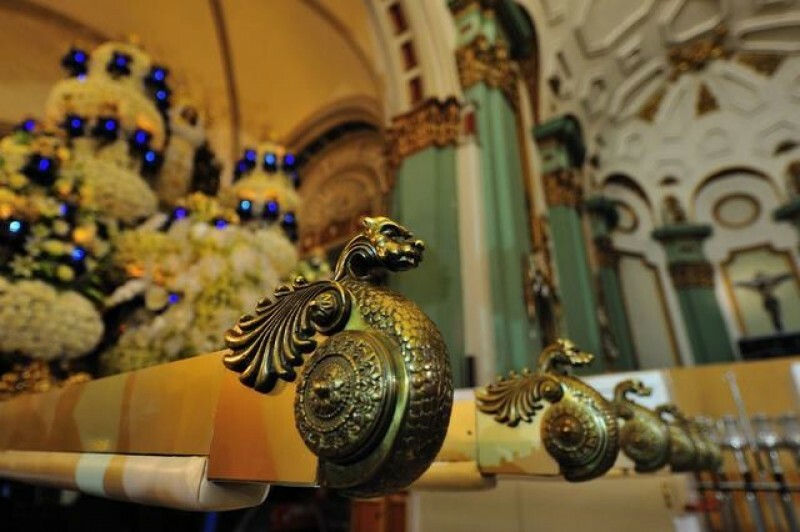 At one point, the Viá Crucis passes the entrance of the church of La Caridad, which is already filled with thousands of flowers from the floral offering, and the components of the Via Crucis acknowledge the “patrona” before continuing on their route. Following this is the first main procession of the week. 03.30: Having gathered 30 minutes before, the Cofradía de Cristo del Socorro depart from Calle Sepulcro, next to the old ruined Cathedral of Cartagena, where they will arrive back at 7.45. Accompanied by a single drummer, the participants wear rough woollen robes, and the mood one is one of serious contemplation. Route: Sepulcro, Concepción, Plaza de San Ginés, San Francisco, Campos, San Miguel, Aire (first Station of the Cross at the Iglesia de Santa María de Gracia, to make an offering to the former patrona of the city, the Virgen del Rosell), Honda, Plaza San Francisco, Arco de la Caridad, San Vicente, Plaza del Sevillano, Serreta (second Station of the Cross in the Iglesia de la Santísima Virgen de la Caridad, to attend the 6.00 Eucharist). Following Mass, at 6.30 the procession continues along the streets of Caridad, Plaza Risueño, Duque, Plaza de San Ginés (where the Vía Crucis concludes and the Salve of Cartagena is sung), Calle Concepción and Calle Sepulcro. 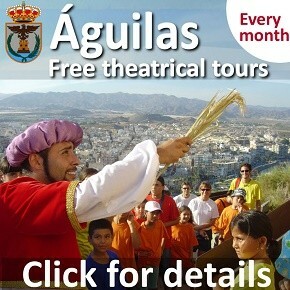 11.00 to 14.00: Children’s parade by members of the Marrajos in the old city centre. 11.30: An ounce of gold is offered in a ceremony at the Iglesia de la Caridad by the Mayoress. 17.00: Floral offering leaving from the Plaza del Ayuntamiento. Hundreds of people dressed in traditional regional costumes leave the Plaza del Ayuntamiento and parade to the Iglesia de la Caridad where they make floral offerings to the patron of Cartagena, which are placed in a huge frame outside the door of the church. It´s a good idea to get inside the church if possible, as from time to time the groups form up inside the church and dance in front of the altar. As the floral offering ends, the Via Crucis stops at the door of the church, both the tronos of Mary and Jesus bobbing to acknowledge the patrona before the Via Crucis continues. 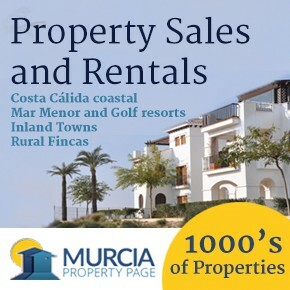 This departs at 6pm from the Capilla y Casa del Cristo in the Plaza de la Merced. It then follows a route around the old town of Cartagena, stopping at the Iglesi ade la Caridad. When it finally reaches the Plaza de la Merced, the “tronos” split off, then meet back up again for what’s known as an “encuentro”, to tumultuous applause and fireworks. 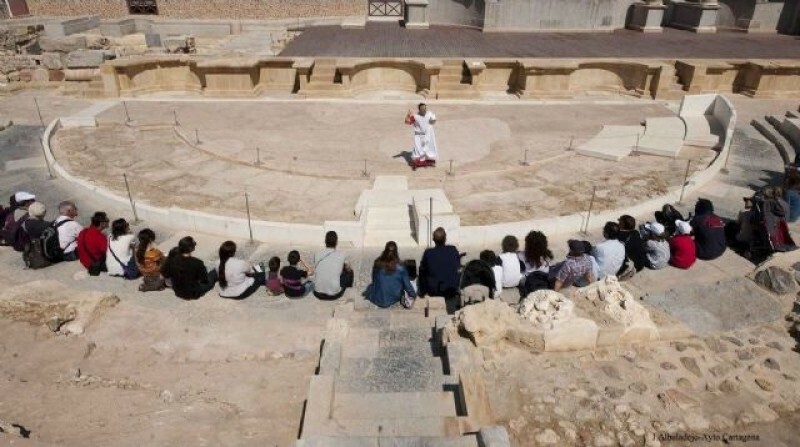 Following this Vía Crucis and joining in, rather than just watching it is quite a special experience, especially for Catholic members of the community. If you can manage to position yourself near to the church, it’s then possible to join in the Vía Crucis and follow it to the Plaza de la Merced for the encuentro, which is quite an experience. There’s time after this for a spot of tapas before finding a place from which to watch the main procession. 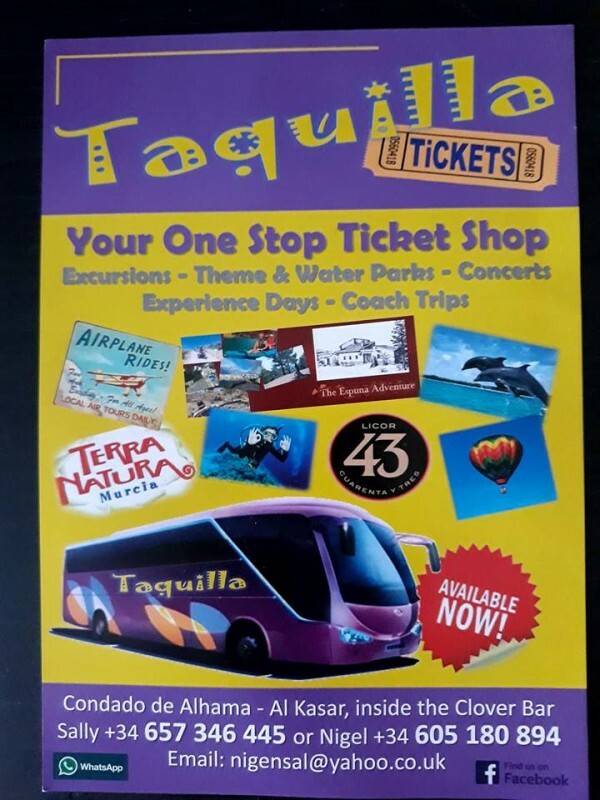 Route: Plaza de la Merced, Duque, Plaza de San Ginés, San Francisco, Plaza San Francisco, Arco de la Caridad, San Vicente, Plaza de López Pinto, Serreta, Caridad, Plaza de la Inmaculada, Duque, and returning to the Plaza de la Merced. 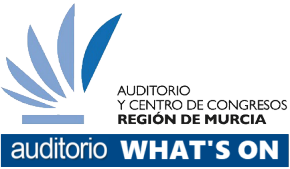 Route: Aire, Cañón, Mayor, Plaza de San Sebastián, Puerta de Murcia, Santa Florentina, Plaza de Juan XXIII, Parque, Plaza de López Pinto, Serreta, Plaza de Serreta, Caridad, Plaza de la Inmaculada, Duque, Plaza de San Ginés, San Francisco, Campos, Jara, Aire and the Iglesia de Santa María de Gracia. All of the figures carried in this procession were sculpted by Jose Hernández - Alegoría de los Siete Dolores de la Virgen, Jesús y María en casa de Lázaro, La Despedida de Jesús de la Santísima Virgen, Santísimo Cristo de la Misericordia and María Santísima del Rosario en sus Misterios Dolorosos, and most are carried by female members of the Californios. With a multitude of individual “tronos” and processions criss-crossing the streets, this is a difficult evening to follow as the tronos appear to be all over the place! They´re listed for those who want to try and watch this, but it’s not an easy one, and although there’s a certain charm about the almost furtive movements of tronos in the back streets of the city, this is not typical of the larger scale parades which characterise other nights in Cartagena. 18.00: The figure of Nuestro Padre Jesús Nazareno (Our Father Jesus of Nazareth) is taken by the Cofradía Marraja from the Iglesia de Santo Domingo to the Iglesia de Santiago Apóstol in the fishing district of Santa Lucia. Route: Mayor, Plaza de San Sebastián, Jara, Campos, San Francisco, Plaza San Ginés, Duque, Plaza de la Merced, San Diego, Plaza de Bastarreche, Avenida Trovero Marín, Puente Mompeán, Paseo Delicias. Arrives at the Iglesia de Santiago Apóstol at 19.25. 19.00: The figure of Nuestro Padre Jesús de Medinaceli is taken by the Cofradía Marraja from the Iglesia of Santa María de Gracia to the former Marine hospital (ETS campus) . Route: Aire, Cañón, Principe de Vergara, General Ordóñez, going up the Rampart, Muralla del Mar and University campus. Concludes at 19.48 at the former Marine hospital (ETS campus). Route: Iglesia Santa María de Gracia, Aire, Plaza de San Sebastián, Puerta de Murcia, Calle Carmen, Plaza España (east side) and Colegio Carmelitas. 20.00: The figure of the Santísimo Cristo de la Agonía is taken by the Cofradía Marraja from the Colegio del Sagrado Corazón de Jesús in Calle Saura to the Iglesia de Santa María de Gracia in Calle Aire. Route: Calle Saura, Gloria, Subida a San Diego, Plaza Merced, Duque, Serreta, Arco de la Caridad, Plaza de San Francisco, Campos, San Miguel, Aire, arriving at the Iglesia de Santa María at 21.00. The figure will remain here until it is featured in the procession of Good Friday. 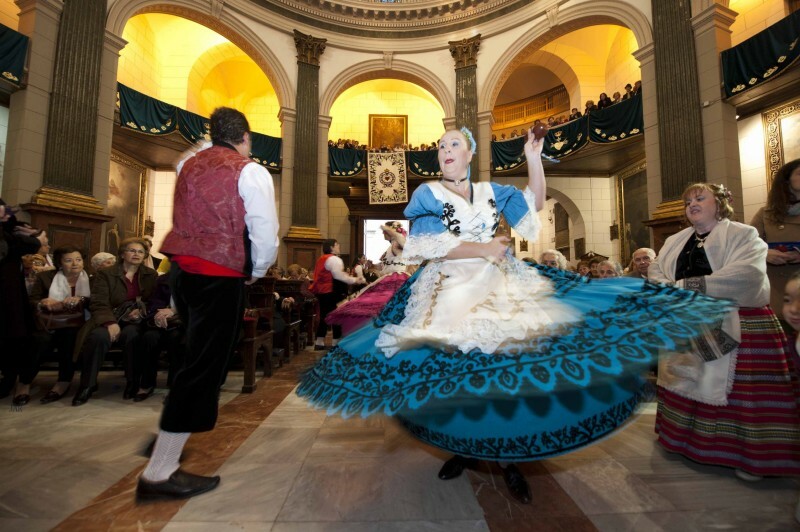 This event has been held since 1910, when it was candle-lit and went from Calle Adarve to the Iglesia de Santo Domingo. 20.30: The figure of the Virgen de la Esperanza (Cofradía Marraja) is taken from the Colegio de las Carmelitas to the Puertas de Murcia. Route: Plaza España (east side), Carmen, Puerta de Murcia. 20.30: The figure of the Santísimo Cristo de la Sentencia (Cofradía California) is taken from Calle Cristo de la Sentencia to Calle Carmen. Route: Calle Cristo de la Sentencia (next to the police station), Menéndez Pelayo, Plaza de España (west side), Calle Carmen. 20.30: The figure of the Santísima Virgen de la Soledad de los Pobres is taken by the COfradía Marraja from the church of San Diego to the church of Santa María de Gracia. Route: Plaza de Jaime Bosch, San Diego, Plaza de la Merced, Duque, San Ginés, San Francisco, Campos, San Miguel, Aire, ending at the church of Santa María de Gracia. 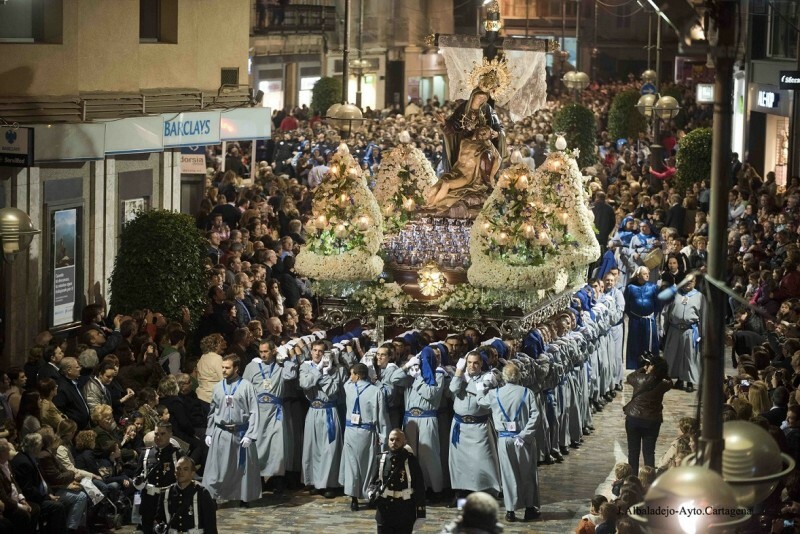 20.45: The figure of the Virgen de la Vuelta al Calvario is taken by the Cofradía California to Puertas de Murcia. Departure from the Parque de Artillería, López Pinto, Parque, Plaza Juan XXIII, Santa Florentina, Puertas de Murcia. 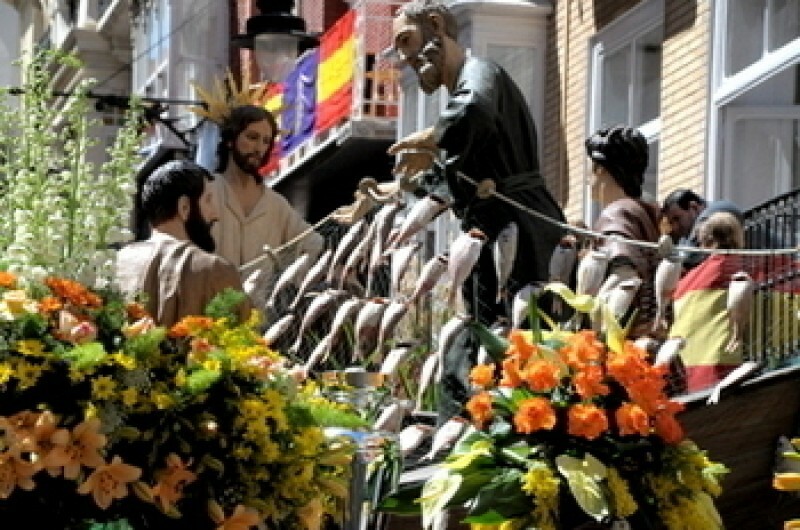 These events include a meeting or “encuentro” of the Cristo de la Sentencia, the Virgen de la Vuelta al Calvario and the VIrgen de la Esperanza in Calle Carmen, from where the three continue along Puertas de Murcia, Plaza San Sebastián and Aire to the Iglesia de Santa María de Gracia. This is one of the most important days of Semana Santa for the Cofradía California, and begins during the morning when the Roman soldiers of the brotherhood parade through the city centre, prior to the main event in the afternoon and evening. This is a popular procession to watch as is very family orientated and many children participate. It’s also visual, with biblical elements making it a lighter and more joyful procession. The procession leaves from the Church of Santa María de Gracia. These biblical elements include Moses, King David, the Ark of the Covenant and King Herod, as well as the Roman soldiers, and the sculpted figures carried through the streets number among them José Sánchez Lozano’s San Pedro Apóstol, La Elección de los Zebedeos by Juan José Quirós, the Sermon on the Mount by Juan González Rey, La Imposición del Primado by José Hernández, Los Milagros de Jesús by Juan José Quirós, Jesus on the road to Jerusalem by José Hernández, La Unción en Betania by José Hernández Navarro, and Jesus Entering Jerusalem by José Sánchez Lozano. Route: Aire, Cañón, Mayor, Plaza de San Sebastián, Puertas de Murcia, Santa Florentina, Parque, Plaza López Pinto, Serreta, Plaza de la Serreta, Caridad, Plaza de la Inmaculada, Duque, Plaza de San Ginés, San Francisco, Campos, Jara, Aire, and back to the Iglesia de Santa María de Gracia. This is the first procession of the Cofradía Marraja during Easter Week, and is known as the “procession of promises” due to the large quantity of these which accompany the procession of the Virgen of Piety and Charity. Although this isn’t the largest of the Cartagena processions, it’s of special significance to residents, with just one sculpted tableau (the Santísima Virgen de la Caridad, created by José Capuz in 1925) and 2 smaller images at the centre of a tide of devotion, with the townspeople following behind. The images arrive at the Iglesia de la Caridad amidst a sea of the faithful at about 23:40, and the salve of Cartagena is sung by spectators before the throne continues to Santa María de Gracia. 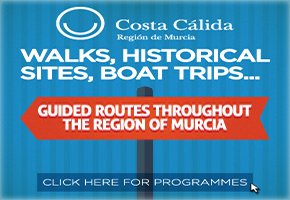 Route: Aire, Cañón, Mayor, Plaza de San Sebastián, Puertas de Murcia, Santa Florentina, Parque, Plaza de López Pinto, Serreta, Caridad, Plaza del Risueño, Duque, Plaza de San Ginés, San Francisco, Campos, San Miguel, Aire and back to the church of Santa María de Gracia. This is an important day for the military elements of Cartagena, with the three apostles departing from three different military buildings, Saint James (Santiago) from the Admiralty, Saint John from the Artillery Headquarters, and Saint Peter from the Military Arsenal. The three then meet at the Plaza San Sebastián, whence they continue to the church of Santa María de Gracia. 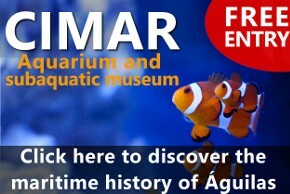 This is an event full of local history, with its roots lying in Cartagena’s military and marine traditions. In 1755 the rigging staff who worked in the Military Arsenal asked if they could pay for the costs of transporting San Pedro in the Procession of the taking of Jesus, which was accepted, providing that Saint Peter went onto the military payroll. And he remained on the payroll up until 2012, shown as Pedro Marina Cartagena, when he was officially removed and retired. However, the tradition which took place every Holy Tuesday still continues, when he asks the admiral for leave to attend the procession. This is granted to him, so following a prayer for all those who have given their lives for Spain, he is carried to the Plaza de Armas, where he is solemnly granted leave, on condition that he is back by Thursday. Naturally, he never is, so he is solemnly arrested when he returns at the end of Semana Santa and is held in formal military custody until the following year. From here, with military precision, the float emerges from the military arsenal at 20.38 and heads to the church of Santa María de Gracia. 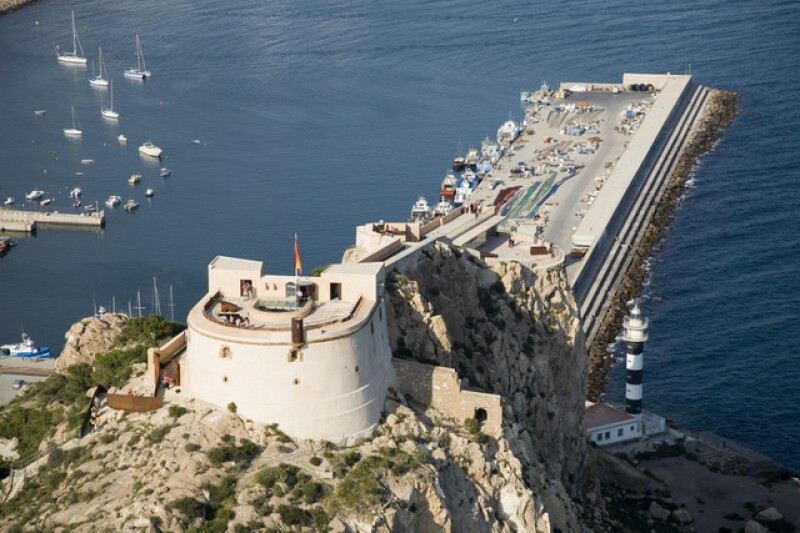 Saint John (San Juan Evangelista), meanwhile, has left the Antiguo Parque de Artillería in Plaza de López Pinto at 20.34, the same time at which Saint James (Santiago) has departed from the Muralla del Mar and the Palace of the Military Government which overlooks the port of Cartagena. These exact timings alter every year depending on the time of sunset. San Juan departs from the Artillery Headquarters. 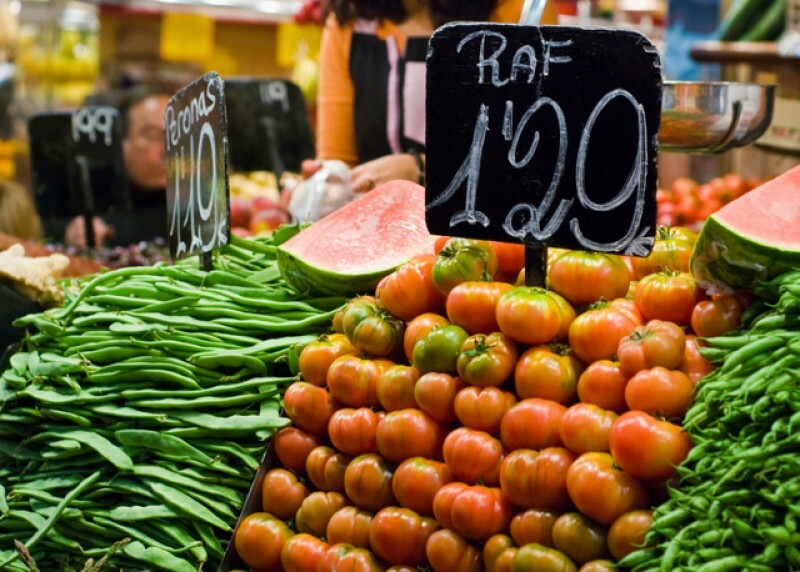 Route: Plaza de López Pinto, Serreta, Plaza de Serreta (where a floral offering is made in the Iglesia de la Caridad), Caridad, Plaza de la Inmaculada, Duque, Plaza de San Ginés, San Francisco, Campos, Jara and Plaza de San Sebastián. Santiago leaves the Naval headquarters in Muralla del Mar. Route: Príncipe Vergara, Subida de las Monjas, Plaza Ayuntamiento, Cañón, Aire, San Miguel, Campos, Plaza San Francisco (west side), Ignacio García, Balcones Azules, Honda, Plaza de San Sebastián. San Pedro leaves from the Military Arsenal. Route: Real, Castellini, Puerta de Murcia and Plaza de San Sebastián. The three Apostles meet in the Plaza San Sebastián at approximately 21.30 and continue together along Mayor, Cañón and Aire to the Iglesia de Santa María de Gracia. They are accompanied by the allegorical Angel of Passion. 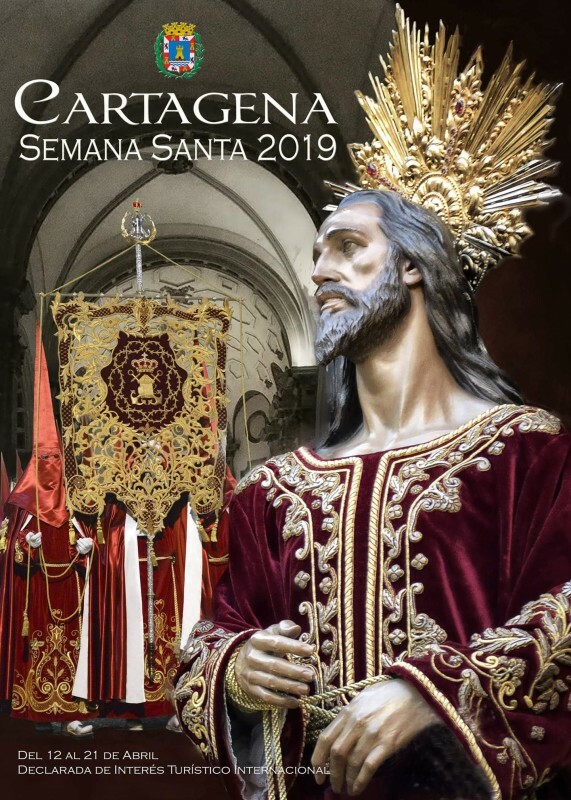 This is the most important day of Easter Week for the Cofradía California, and includes one of the great processions of Semana Santa in Cartagena, with 13 tronos (sculpted tableaux) taking part. 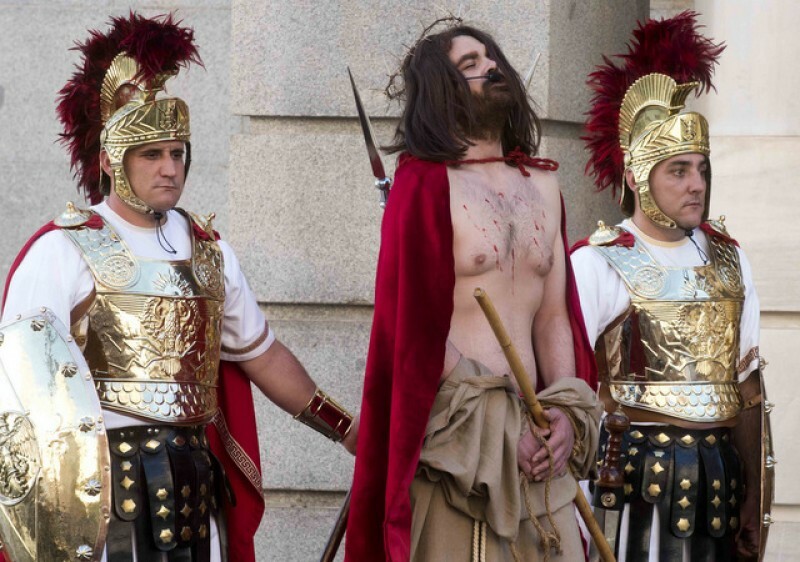 17.45: Before the procession begins there is a dramatized performance of the trial of Christ in the Plaza del Ayuntamiento, in which Pontius Pilate washes his hands of the whole situation, and then throws the water over the watching crowd. Following the theatrical representation the crowds file off to the church of Santa María to view the “tronos” all lined up ready for departure. The procession narrates the story of the betrayal of Christ through the order of the tronos, and is a huge affair full of light, flowers, music, swaying satin and colour. 21.00: The procession of the “Prendimiento” (The Taking of Christ) departs from the Iglesia de Santa María de Gracia, where it will not return until 3.00 in the morning. 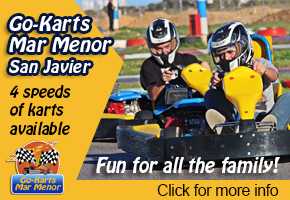 Route: Aire, Cañón, Mayor, Plaza de San Sebastián, Puerta de Murcia, Jabonerías, San Roque, Carmen, Santa Florentina, Plaza Juan XXIII, Parque, Plaza López Pinto, Serreta, Plaza de la Serreta, Caridad, Plaza de la Inmaculada, Duque, Plaza de San Ginés, San Francisco, Campos, Jara, Aire, and back to the Iglesia de Santa María de Gracia. The “carro bocina”, which carried the coat of arms of the Cofradía. The women of the “Prendimiento” group, carrying its shroud and other insignia. The “Granaderos” (grenadiers), wearing 18th century marine artillery uniforms. The tableau of the Last Supper, figures of Jesus and the Disciples by García Talens (1949). The tableau of the Oración en el Huerto (the Garden of Gethsemane) with the three sleeping disciples carved by none other than the grand master Francisco Salzillo in 1761. Jesus and the angel are by Sánchez Lozano. The tableau of the Kiss of Judas, with Malchus and a fallen guard by Salzillo (1762)and the figures of San Pedro, Jesus, Judas and other guards by Mariano Benlliure (1946). The tableau of the Taking of Christ, by Benlluire (1942). The Roman Soldiers (popularly known in Cartagena as “los judíos” (the Jews). The allegory of the Angel. The trial of Jesus, featuring the last sculpture created by Sánchez Lozano for the californios. The tableau of the Arrepentimiento de San Pedro (the repentance of Saint Peter), created by José Hernández Navarro in 2004. The tableau of the Santísimo Cristo de la Flagelación, by Mariano Benlliure. The Crown of Thorns (Federico Collaut-Valera, 1963). The Sentencing of Jesus (José Hernández Navarro, 1991). Santiago Apóstol (Sánchez Lozano, 1977). San Pedro (Sánchez Lozano, 1940). San Juan Evangelista (Mariano Benlliure, 1946). La Virgen del Primer Dolor, also known as the “Madre de los Californios”, created by Benlliure in 1946 as a reproduction of the 1879 original by Mancha and Requena. The 73rd Anti-Aircraft Artillery regiment. On this night the lights are turned out and the penitents walk in silence. It’s an atmospheric, moving procession, with the silence pierced only by the sound of a Saeta, sung from a balcony above the street. If possible, stand near the entrance of the Church, to watch the Pasos as they arrive back, and the moment when the Hail Mary is sung is really emotional and very moving. 20.45: The rules of the procession, which were drawn up in 1928, are read, obliging all of those taking part except the Hermano Mayor of the brotherhood and the Capellán to keep their faces covered and maintain strict silence. 21.00: The Procesión del Silencio y del Santísimo Cristo de los Mineros leaves the Iglesia de Santa María on the following route: Aire, Cañón, Mayor, Plaza de San Sebastián, Puerta de Murcia, Santa Florentina, Parque, Plaza Juan XXIII, Parque, Plaza de López Pinto, Serreta, Plaza Serreta, Caridad, Plaza de la Inmaculada, Duque, Plaza de San Ginés, San Francisco, Campos, Jara, Aire and back to the Iglesia of Santa María de Gracia where the traditional Hail Mary is sung as the pasos re-enter the church. The standard bearers of the Cofradía. The Tercio del Ósculo, who march with a fallen cross carried by four penitents, lit by four lanterns. The tableau of the Ecce Homo with the image of the Taking of Christ by Manuel Benlliure. The tableau of the Santísimo Cristo de los Mineros, the only figure of the Crucifixion paraded by the Californios (García Talens, 1958). The tableau of the Vuelta al Calvario (the return to Calvary) by José Sánchez Lozano, with the figure of María de Cleofás by García Talens. The tableau of the Virgen de la Esperanza (Pérez Comendador, 1943). The armed group of the Granaderos. 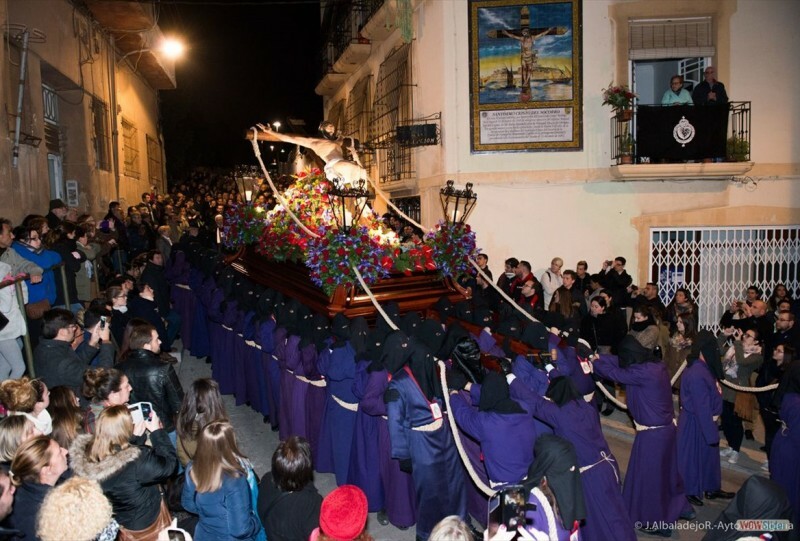 The early morning processions of the Cofradía Marraja are some of the most atmospheric and meaningful acts of the week, but are rarely seen by visitors because they take place before dawn on the morning of Good Friday. The climax of the five processions is the “Encuentro” in Plaza de la Merced at 5.40 a.m.
0.05: The longest day of processions in Semana Santa begins at just after midnight when the Roman soldiers and “Granaderos” set out from Callejón de Bretau, just off Calle Jara. 3.05: The Procesión de la Mujer Verónica leaves the Iglesia de Santa María de Gracia on the following route: Iglesia de Santa María de Gracia, Aire, Plaza de San Sebastián, Honda, Plaza de San Francisco, Arco de la Caridad, Caridad, Don Roque, Plaza de Roldán, Calle Saura, Calle Gloria, Calle San Diego, Plaza de la Merced. Standard bearers of the Cofradía. The platform of the “Carro Bocina” (Manuel Orrico Gay, 1969). The Grenadiers who have taken part in this procession since the 18th century. The tableau of the Condena de Jesús (Juan Abascal). The tableau of Verónica (Federico Coullaut-Valera, 1948). 3.10: Jesus of Medinaceli leaves the Polytechnic University of Cartagena. The figure created by Juan González Moreno takes the following route: University, Muralla Carlos III, San Diego, joining up with the first procession in Calle de la Gloria. 3.30: Jesus of Nazareth leaves the Santa Lucia fish market through a wrought iron gate which is opened only on this occasion every year. The statue was sculpted by José Capuz in 1945, and is accompanied by the Roman soldiers or “Judíos”. Route: Pescadería, Calle de Jesús, Pinacho, Paseo Delicias, Puente Mompeán, Avenida Trovero Marín, Plaza Bastarreche, San Diego and Plaza de la Merced. 3.45: The Santísima Virgen Dolorosa (Our Lady of Sorrows, sculpted by José Capuz in 1943) leaves the church of Santa María de Gracia on the following route: Aire, Jara, Campos, Plaza de Francisco, Arco de la Caridad, Caridad, Plaza Risueño, Don Roque and La Plaza de la Merced. 5.30: The elaborately choreographed route planning leads to the “encuentro” outside the Palacio Aguirre in the Plaza de la Merced, before the groups carry on together to the church of Santa María de Gracia via Duque, Plaza de San GInés, San Francisco, Campos, San Miguel, Aire, Cañón, Mayor, Plaza de San Sebastián and Aire before arriving back at the Iglesia de Santa María de Gracia. 8.00: The marathon procession ends at the Iglesia de Santa María. 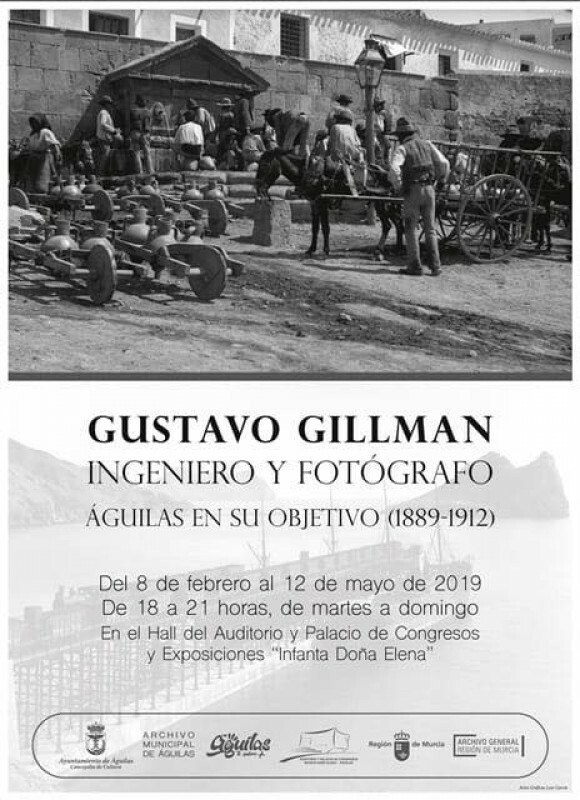 12 splendid tableaux take part in this procession of the Holy Burial, which holds some of the greatest sculptural works in Cartagena’s collection. It’s the longest of the processions, and includes some of the most beautiful “tronos” on display throughout the week. These include numerous works by José Capuz, including the Descedimiento (1930) and the Santo Sepulcro (1926), and one recommended spectating spot is next to the Icue monument at the junction of Calle Puertas de Murcia, Calle Sagasta and Calle Carmen. The last tableau, featuring the figure of the Santísima Virgen de la Soledad, leaves the church at approximately 23.05. Route: Aire, Cañón, Mayor, Plaza de San Sebastián, Puertas de Murcia, Sagasta, Puerta de Madrid, Carmen, Santa Florentina, Parque, Plaza de López Pinto, Serreta, Caridad, Plaza del Risueño, Duque, San Francisco, Campos, Jara, Aire, Iglesia de Santa María. Grenadier cadets (children) with the insignia on the “Carro Bocina”. The tableau of Nuestro Padre Jesús Nazareno (José Capúz, 1945). The tableau of the Expolio de Jesús (the 10th Station of the Cross) (Juan Abascal Fuentes). The tableau of the Santa Agonía de Cristo (the Agony of Christ). The statue of Jesus is by Carles Flotats i Galtés, and that of Mary is by Efraín Gómez Montón. The tableau of La Lanzada (Antonio García Mengual). The tableau of the Santísimo Descendimiento (Jesus being taken down from the Cross) (José Capúz, 1930). The tableau of the Santísima Virgen de la Piedad (José Capúz, 1925). The tableau of the Santísimo Enterramiento de Cristo (Juan González Moreno, 1959). The Roman soldiers or “Judíos”. The tableau of the Santo Sepulcro and CHrist fallen (José Capúz, 1926). The tableau of Santa María Magdalena (José Hernández Navarro, 1984). The tableau of San Juan Evangelista (José Capúz, 1943). 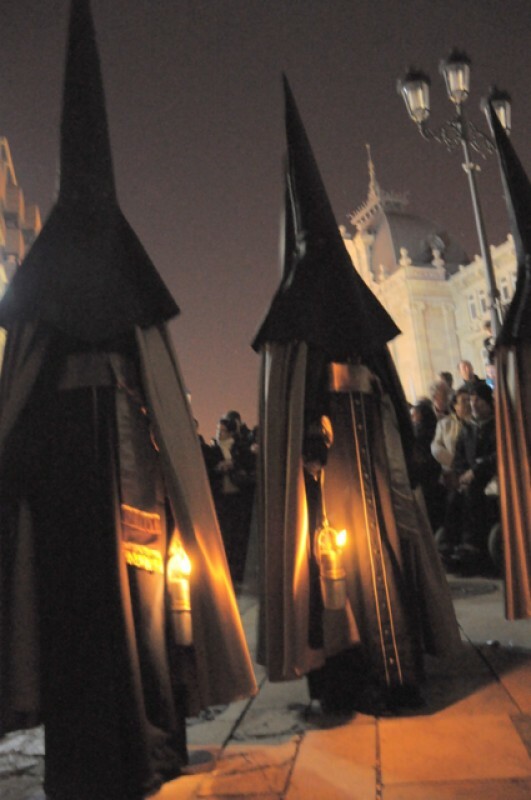 The light son the “capirotes” of the penitents are candles! The tableau of the Santísima Virgen de la Soledad (José Capúz, 1943). The Tercio de Levante marine infantry division. 19.00: Procession of the Vera Cruz (The True Cross) by the Cofradía Marraja. This is the most austere of the processions of the brotherhood, and all lighting is with candles. Route: Iglesia de Santa María de Gracia, Aire, San Miguel, Campos, San Francisco, Plaza de San Ginés, Duque, Caridad, Serreta, Plaza de López Pinto, Parque, Santa Florentina, Puertas de Murcia, Plaza de San Sebastián, Mayor, Cañón, Aire, Iglesia de Santa María de Gracia. Standard bearers (the main standard is a copy of the 18th century original). The holy shroud group and penitents. A replica of the Holy Shroud of Turin. The tableau of the Santo Amor de San Juan en la Soledad de la Virgen (José Capuz, 1953). The Vera Cruz, creadted by gold and silver smiths in Sevilla. The tableau of the Santísima Virgen de la Soledad de los Pobres (Juan González Moreno, 1956). The procession includes one trono carried by women only, 140 of them, the Virgen de la Soledad de los Pobres. In fact there are three saintly women featured, the Virgen de la Soledad (sculpted by Jesús Azcoytia), Santa María Magdalena (José Hernández Navarro) and Santa María de Cleofé (Roque López, 1784). The procession leaves from the door of the Casa de Misericordia, San Diego, Plaza de la Merced, Duque, from where it joins with the procession of the Vera Cruz, and a good place to watch is at the corner of Duque and Calle Caridad. Route: Casa de Misericordia, San Diego, Plaza de la Merced, Duque, where it joins the Procesión de la Vera Cruz. A total change. White, light, flowers, a celebration of Christ arisen, an enjoyable family parade full of light and flowers. Look out for the trono of Saint Peter, who is accompanied by nets full of fish! A long procession organized by the Cofradía del Resucitado, which takes several hours to file past. 10.30: Procession of the Resurrection, starting at the church of Santa María de Gracia. Route: Aire, Jara, Campos, San Francisco, Plaza de San Ginés, Duque, Plaza del Risueño, Caridad, Serreta, Plaza de López Pinto, Parque, Santa Florentina, Carmen, San Roque, Sagasta, Puertas de Murcia, Plaza de San Sebastián, Mayor, Cañón, Aire, Iglesia de Santa María de Gracia. When the Santísima Virgen del Amor Hermoso arrives back at the church, the figure of Nuestro Padre Jesús Resucitado comes out to greet his mother. After the traditional Salve has been sung the Virgen enters the church and the Easter Week processions end with fireworks. Which are the best processions to attend during Cartagena’s Semana Santa? There are many events where it’s not necessary to reserve a seat, but to purchase one is often an excellent idea as the full processions can take 4 to 6 hours to pass by. Seats are sold next to the church of Santa María de Gracia or in Plaza San Sebastián. If you have time, walk the route and choose where to sit as the narrower streets have more atmosphere and street lighting does make a big difference to the experience. Each parade has its own atmosphere and is unique for different reasons, but unless visitors are Catholics and embrace the religious significance of Semana Santa, then the parades are viewed as being of tourist interest, and an insight into the religious customs of Spain. 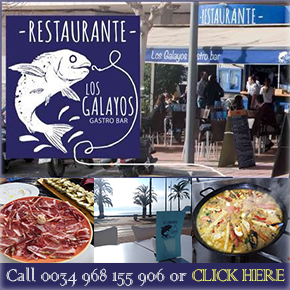 Going into a town or city to watch the parades should be viewed as just part of an experience, and enjoying a spot of tapas or a drink are also part of the evening. 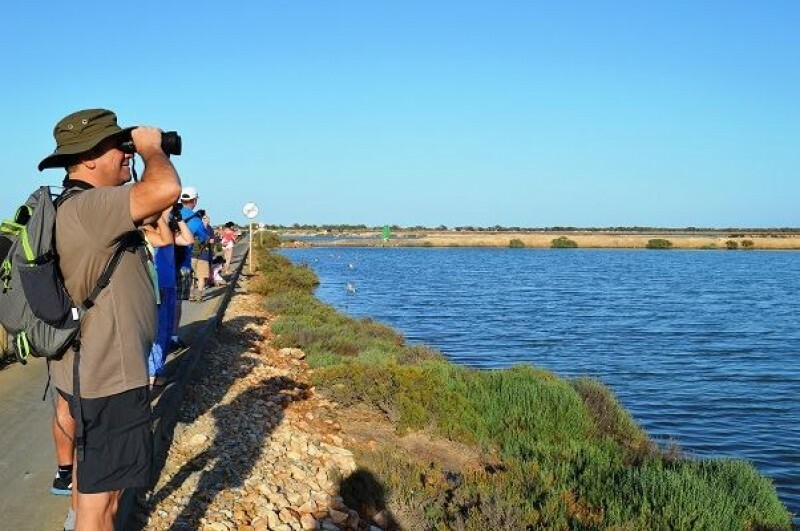 For this reason visitors often prefer to attend the larger parades as there’s more to see. However, there's more to Semana Santa in Cartagena than just processions. Look at the sweets being sold: there are little penitent lollipops, complete with pointed capirotes and staff. 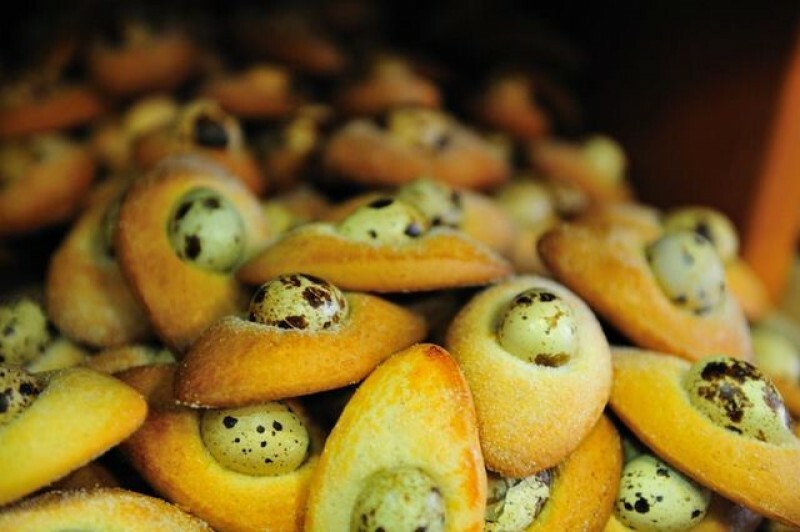 Look in the bakers: eggs are enveloped in traditional mona de pascua cakes sold for Easter week, and there are often tiny versions on sale mad with quali eggs as well as the popular single egg versions which are consumed at home around this time of year. 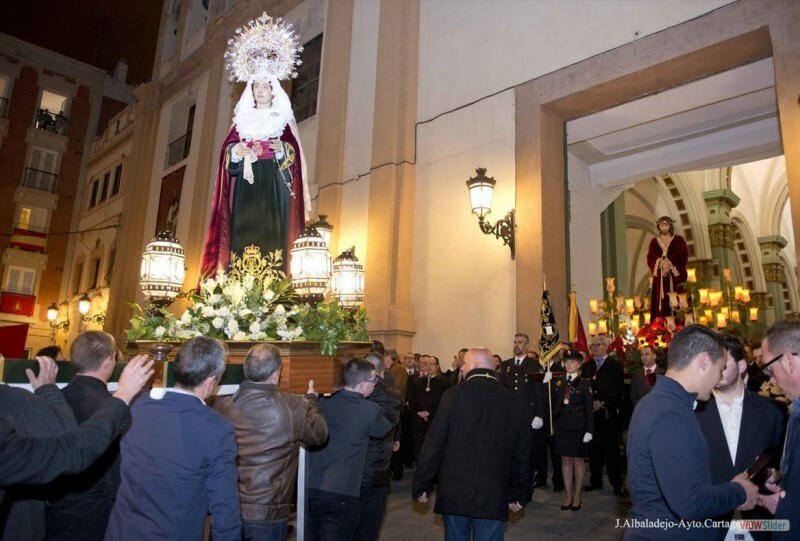 Friday 12th April Viernes de Dolores, Day of the Patrona: the floral offering at 17.00 and the Via Crucis later. Sunday 14th April, Palm Sunday: the Procession of the Palms at 17.00, a children’s procession, with a large number of participants. Wednesday 17th April Easter Wednesday: the dramatized representation of the trial of Christ in the Plaza del Ayuntamiento followed by the first of the large processions. 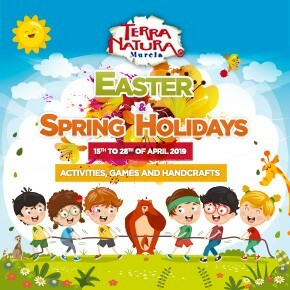 Friday 19th April, Good Friday: the long procession of the Santo Entierro starting at 21.00: buy a seat and take a rug! Sunday 21st April, Easter Sunday: the resurrection procession at 10.30, full of light and life and totally different in its atmosphere from the rest of the week.